Liverpool-based ADHD Foundation is celebrating its 10th anniversary this year as a charity. The Foundation approached Umbrella Store with an idea for a printed umbrella exhibition, which was to be displayed in Liverpool city centre. The idea was to use a street art project to raise awareness for Attention Deficit and Hyperactivity Disorder (ADHD) and autism, hence the colourful Umbrella Project, which ran from the end of June, through to August 2017. Umbrella Store worked with ADHD Foundation’s partners to print designs and logos on the panels of 200 brightly coloured umbrellas, suspended over Church Alley, leading up to the Bluecoat school. The rainbow brolly installation not only offered Umbrella Store an opportunity for greater brand outreach but also to be part of a worthy cause. The 200 umbrellas were signed by pupils from St Oswald’s primary school in Old Swan and also students from other Merseyside schools. These students were excited about the project because many of them have ADHD, autism, and other neurodevelopment conditions. They were an integral part of this project, and their choice of name was an inspiration, as disclosed by Dr Tony Lloyd, Chief executive of ADHD Foundation. Dr Lloyd explained why the name and selected project were relevant to their awareness campaign, by stating that ADHD and autism are ‘umbrella terms’ for a whole variety of neurodevelopment difficulties and that the Foundation wanted to highlight that fact, and also challenge the stigma of these disabilities, which can be ‘invisible’. 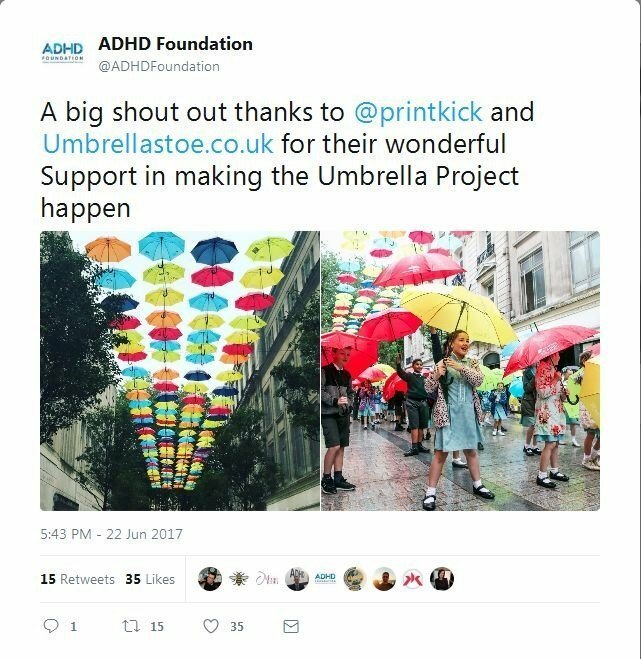 He further said that the Umbrella Project was about reminding adults, including parents, potential employees and teachers, that young people with ADHD and other conditions possess many talents, gifts and skills that they could offer the community. 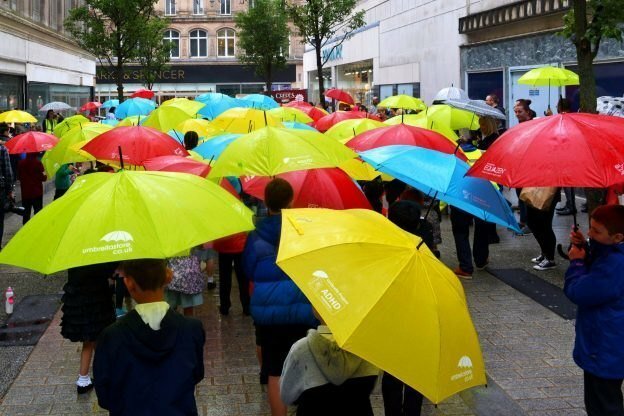 To get involved with the Umbrella Project, local businesses were asked to sponsor an umbrella for £250, which would buy a whole programme of support for families. Additionally, local businesses could display the umbrellas on their premises. 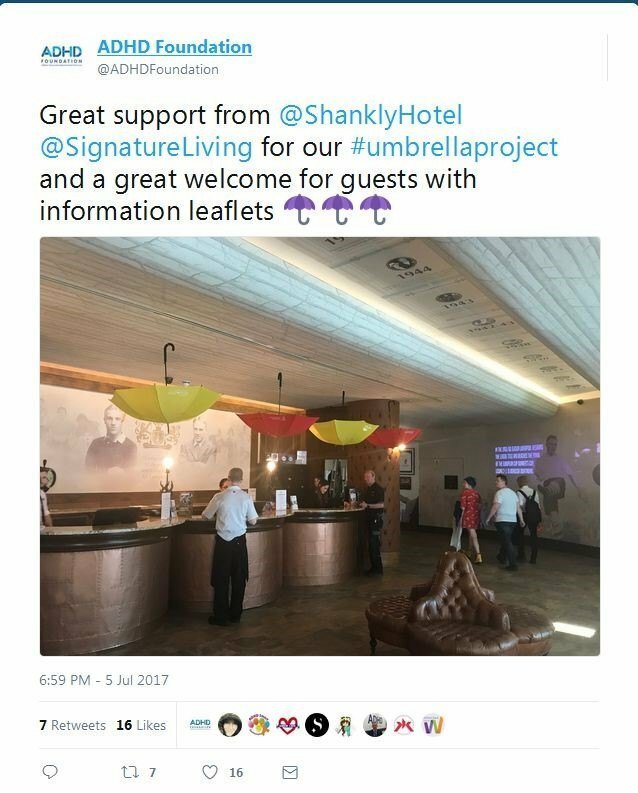 A great example is two companies, Shankly Hotel and Signature Living, who presented the umbrellas, as well as welcomed guests with information leaflets. Mayor of Liverpool, Joe Anderson, was impressed by the project, and fully supported it. He said, “Liverpool City Council is fully committed to supporting the education, mental health and employability of people with ADHD and autism. Raising awareness is fundamental in engaging conversations and promoting the general public’s understanding of ADHD.” He also pointed out that over half a million children were affected by ADHD, with sadly many cases going undiagnosed. He also expressed his desire for Liverpool to be an autism and ADHD friendly city, a goal that the Umbrella Project was trying to achieve. Equazen, which also sponsored the project, was proud to be associated with the project. Dr Emma Derbyshire, public health nutritionist and advisor to Equazen said that the Umbrella Project was an inspirational project which illustrated the complexity and broad spectrum of behavioural issues associated with ADHD. She also reiterated how life-changing an effective therapy for ADHD would be.